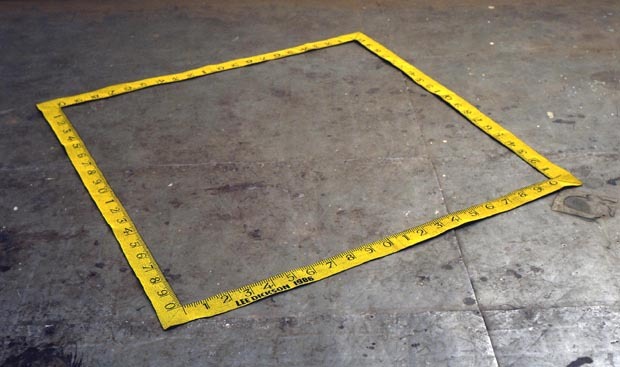 Studio view: Measuring Device, 1988. Photo: the Artist. A square measuring device resembling a yellow tape measure is woven with seed beads, waxed linen warp, nylon weft. The artist’s name and date of completion is woven into the piece. Dimensions: 153 x 153 centimeters. Collection of the Art Bank. Measuring Device is a part of the artist’s first solo exhibition at YYZ Artists’ Outlet, Toronto, and titled Means of Measurement. The other works in this exhibition were: Mattered World, Photo Research and Unresolved. Decalog: YYZ 1979-1989. Toronto: YYZ Books, 1992. Parrallelograme [Toronto] Dec-Jan 1987: 93, photo. Detail: Measuring Device. Photo: the Artist.